Mentoring is the preferred focus; not classes, not lectures, not assignments. The goal is an informal, casual question and answer format over a period of time; not an hour and not an afternoon, but over an indefinite period of time. This article proposes a new addition to the mentoring process: the well-established and easy to use digital communication tools on all of our desktops, tablets, and cell phones. A variety of common digital communication tools in the families of IRC, iChat, Skype, etc. There are many successful practitioners of landscape architecture. These successful, senior-level practitioners at the top of their pay range are experienced in telling the story of landscape architecture for consumption by every possible audience: public meetings, government officials at all levels, and professional colleagues at all levels. These truly fluent senior landscape architects recognize the importance of mentoring students in the transition they make into the practitioners’ offices; the two years on either side of graduation. These senior practitioners are happy to mentor. The question is: how do we match up these senior practitioners and students? The Landscape Architecture Digital Sandbox is my suggestion. A senior practitioner tells a story about a project in its full glory; all associated social, economic, political and ecological impacts. I have done this in The 23 Club. I call it a “landscape story”. It is fiction, but it is built around all the components of a practitioner’s office project. 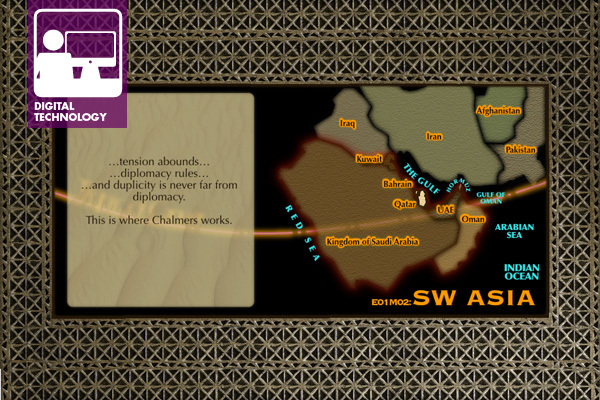 It is set up and structured to provide lots of stubs from which interesting discussions may evolve. Students can access the landscape story, online, anytime at their own convenience. The 23 Club has been put online using a combination of a WordPress blog and a YouTube playlist. The 23 Club is divided into twelve episodes, and each episode is subdivided into an average of six parts. Each part averages three to six minutes in length. The duration of each discrete part makes a short digestible chunk. Each part has landscape workplace content. Students go to the WordPress blog and scan the descriptions of the episodes and the parts. They can select whatever interests them, then listen and watch either aural book or multimedia, as fed from YouTube in three to six minute chunks. If students have curiosity regarding some aspect of landscape architecture in the story, the author can be contacted via the WordPress blog. From there, the practitioner and the students can advance mentoring communication in any means that is convenient to both. Think of it as a simple and transparent format that respects the busy schedules of all and provides a freedom of convenience along with one-to-one mentoring format. 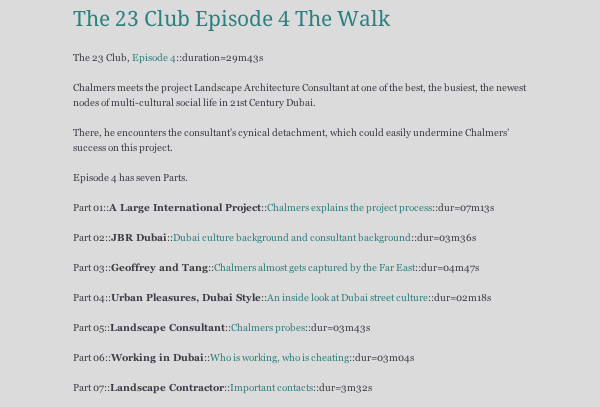 The Landscape Architecture Sampler for The 23 Club, on YouTube, provides students an introduction to both the format and the content quality. 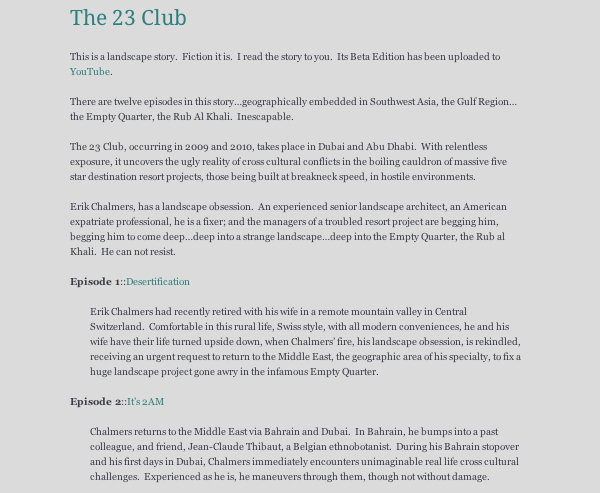 From that sampler, students can link to The 23 Club’s WordPress blog, which provides a text description of the landscape story and its main character, along with links to each episode. Students access landscape story plot, main character description, and episodes descriptions. From those episode descriptions, students have one additional link to each episode including enriched descriptions of the episode and each part therein, all with time durations. Students have the choice to link to The 23 Club YouTube channel for the entire episode or simply to one of the shorter parts. Students access the landscape story episode and parts links. After engaging the story, students can return to the The 23 Club WordPress blog to contact the senior practitioner via comment. What is the sandbox? The concept is a digital location for landscape architecture students and landscape architecture mentors to meet when they want, and make what they want. Painless chit-chat about the landscape architecture profession between students and senior office practitioners is priceless. The proposed process takes a little front end work by the senior practitioners, but it is the same thing they have been doing all their careers: telling a good landscape story. Edward Flaherty, ASLA International, RLA in California and Florida; past Digital Technology PPN chair; national and international award winning design, construction and digital communications; published LAM writer; international conference speaker.